Ah forbidden love, when falling for the the wrong woman can get you buried alive and cursed for all eternity! 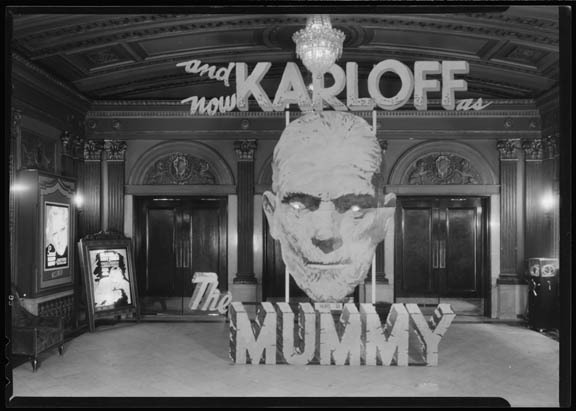 In the 1932 film The Mummy directed by Karl Freund, archeologist Sir Joseph Whemple pays no attention to all the dire warnings guarding the tomb of Imhotep (despite the fact that these curses tend to make no distinction between thieves, grave robbers, and archeologists) and digs him right up. He also leaves the life-giving Scroll of Thoth just laying about for his idiot assistant to read aloud, raising Imhotep from the dead — and next thing you know there’s a mummy shambling about. Of course in proper ancient Egyptian mummification, the brain was smashed with a long hook, drawn out through the nose, and thrown away. 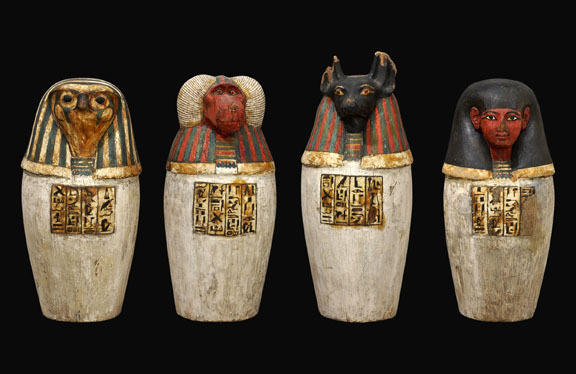 They didn’t believe it was worth preserving, so while all the other organs got beautiful canopic jars, the brain went into the trash. 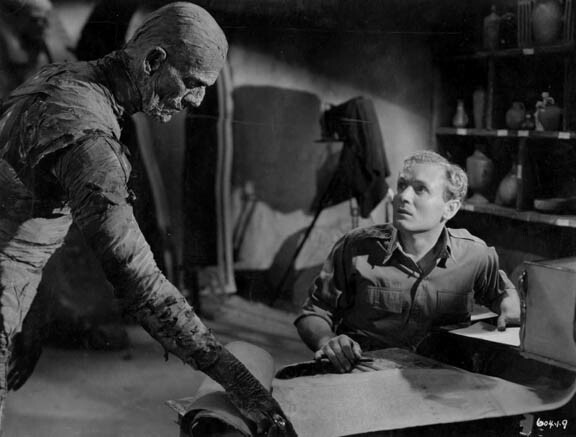 (Which does make one wonder how a mummy can walk around at all, much less come up with diabolical plots.) The heart was left in place because it was believed to be the center of intelligence and feeling. If you’re wondering why they bothered to pull any organs out at all, it’s because the liver, lungs, stomach and intestines rot very quickly, so they went into gorgeous little containers. 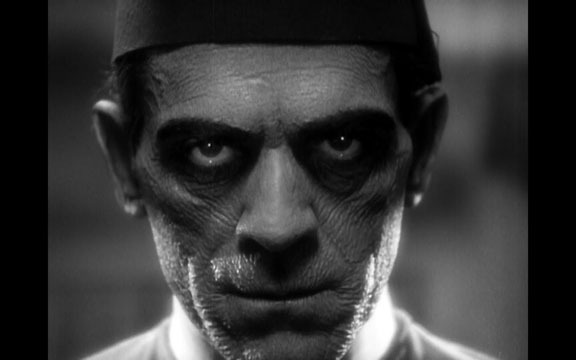 In The Mummy we get the ever fantastic Boris Karloff as Egyptian priest/mummy Imhotep, with terrific makeup by Jack Pierce, who also developed the completely iconic look for Karloff in Frankenstein. But why was Imhotep a mummy in the first place? Back in in the day, Imhotep loved the princess Ankh-es-en-amon soooooo much that he tried to resurrect her from the dead. Love makes you do the wacky! 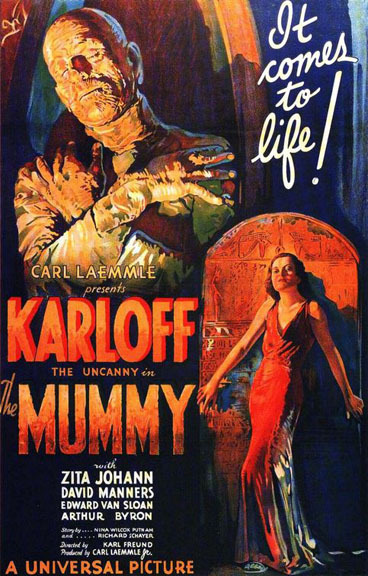 For this crime he was mummified while still alive, which actually looks pretty tame in the movie (people probably didn’t want to see Karloff’s brain being yanked out of his nose). Freshly resurrected after thousands of years, what does he want, revenge? A hot bath and a loofah? No, he wants love. Still. At this point I need to digress and tell you about how I mummified a Barbie doll when I was a kid. Obviously I didn’t remove her organs, but I did wrap her up in gauze bandages, painted hieroglyphs all over them, and buried her in the back yard. This was necessary because I’d tried to clean ball point pen off of her face with nail polish remover (epic beautification FAIL), which removed all of her features and melted a good bit of her hair off as well, turning her into something a bit scary looking that needed to go away immediately. I was obsessed with ancient Egypt (I think the King Tut exhibit had just rolled through town) and mummifying Barbie seemed like the only logical option at the time. I like to imagine that decades later when someone was digging a flowerbed they thought, however briefly, that they’d discovered The World’s Tiniest Egyptian Mummy. Right, so Imhotep spends the next ten years clearly applying a lot of moisturizer and turns up as Ardeth Bey. This is a great roll for Karloff because unlike the mute monster in Frankenstein, Ardeth can talk — and that voice! Those eyes! He’s completely hypnotic in every scene. And what are we learning? Love never dies, it just gets kinda creepy and wrinkled. He posits himself as a local “expert” and helps Whemple’s son to find his beloved Ankh-es-en-amon’s tomb so they can dig her up and he can use to scroll to be reunited with his long lost love. Alas his resurrection doesn’t work — because what he needs isn’t her body, it’s her soul, currently residing in Helen Grosvenor (coincidentally Whemple junior’s GF). Believing she is the reincarnation of his lady love he realizes he must kill her so he can mummify and resurrect her. Sounds crazy but guess what? He’s not wrong, she is the reincarnation of Ankh-es-en-amon! 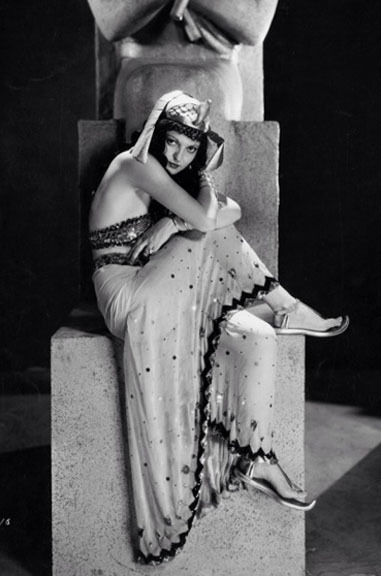 Unfortunatley, while Imhotep’s love survived thousands of years hers somehow did not and she calls on her past life memories, praying to the goddess Isis to save her. [Spoiler Alert!] Isis’ statue raises its arm and blasts the Scroll of Thoth to ashes, which is pretty much what happens to Imhotep too. For me this kinda raises the question — if she was filled with her past life memories, where was the memory of her love for Imhotep? Honestly this ending bums me out, it’s very similar to the ending of The Bride of Frankenstein when [Spoiler Alert!] the Bride, created to be a mate for the monster, can’t stand the sight of him. I guess I’m a hopeless romantic — I’m always rooting for the monster to get the girl in the end. Because the Mummy didn’t bring himself back to life I see him in kind of the same category as Frankenstein’s monster, the Wolfman, and the Bride — so he was the last creature to join my Monster Martyr series of paintings. 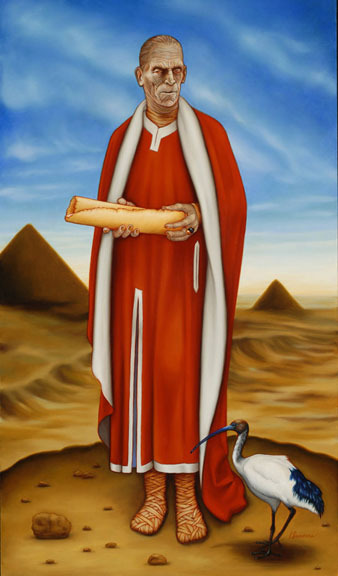 Christian martyrs were often depicted holding the object of their martyrdom (aka the thing people used to put them to death), and the Mummy is holding the Sacred Scroll of Thoth. He is accompanied by a sacred ibis, which in Egypt was associated with the god of writing and scribes, Thoth. As in all the paintings in this series, the bird represents a messenger that can fly between the worlds of the living and the dead. To celebrate my favorite time of year, Halloween, all of the Monster Martyr paintings are available right now as throw pillows — you can pick out your fave or collect the whole set!